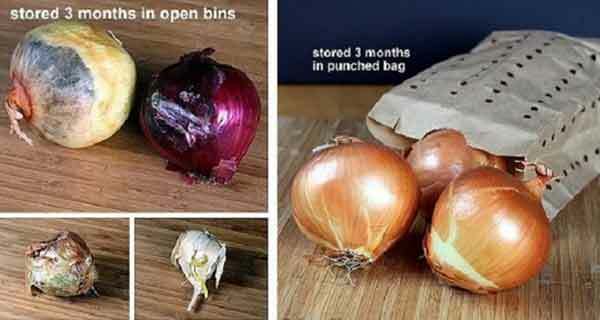 Home » Health » How To Store Your Garlic & Onions So They Last For Months! As we are always in need of time, we tend to buy groceries in bulk. But, stocking up on the wrong things can lead to waste and spoilage, so, much of the food you pile up for use actually ends in the garbage can instead in your dish. This affects your home budget too. The article below can give you some useful tips how to extend the shelf life of certain produce. Start by punching the bags randomly or throughout the upper half of the bags. First, you fold the bag a few times, either across or lengthwise, then punch in a row, leaving 1 inch of space between the holes. You should get several rows of holes. Don’t worry if you don’t get equal distances between the holes as they only serve for airing. Next, fill half the bag with garlic or onions. Fold it at the top, clip it and label it. The holes will actually let air flow around the vegetables, and the bag will keep the produce fresh longer. Store the onions and garlic as normal, but make sure you don’t overcrowd them. There are other factors that also affect the effectiveness of this method including the light conditions, the temperature and the humidity of the storage place. Don’t keep potatoes close to your onions and garlic. Potatoes release gases that will speed up decaying. Don’t even keep these two vegetables in the same drawer. Don’t use closed plastic bags. An open paper or plastic bag is far more effective. Namely, if you store produce in air-tight bags, there won`t be enough air, which will speed up sprouting and decaying. Don’t refrigerate onions and garlic, but store them in a dark and dry place instead. This can be your basement or pantry. The cold temperature in the fridge will only make the onions softer. Then they start giving off their smell and other food in your fridge can easily absorb it.